Syrian Talmudist of the tenth century. From Salmon b. Jeroham's commentary to Psalms (cxl. 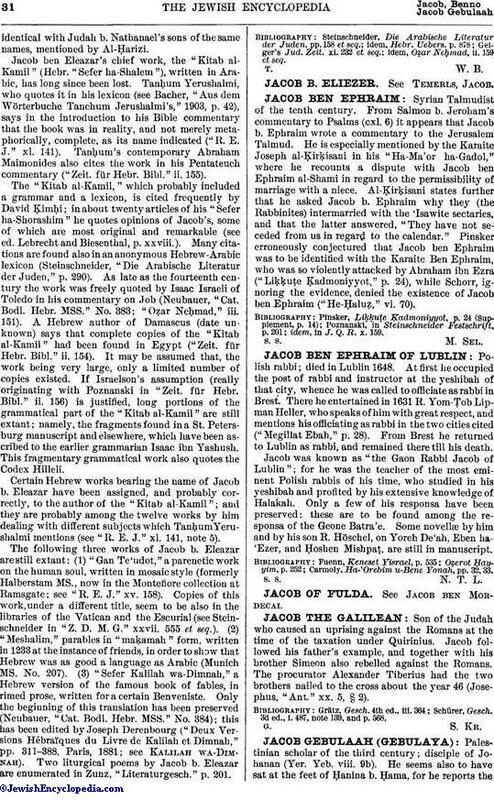 6) it appears that Jacob b. Ephraim wrote a commentary to the Jerusalem Talmud. He is especially mentioned by the Karaite Joseph al-Ḳirḳisani in his "Ha-Ma'or ha-Gadol," where he recounts a dispute with Jacob ben Ephraim al-Shami in regard to the permissibility of marriage with a niece. Al-Ḳirḳisani states further that he asked Jacob b. Ephraim why they (the Rabbinites) intermarried with the 'Isawite sectaries, and that the latter answered, "They have not seceded from us in regard to the calendar." Pinsker erroneously conjectured that Jacob ben Ephraim was to be identified with the Karaite Ben Ephraim, who was so violently attacked by Abraham ibn Ezra ("Liḳḳuṭe Ḳadmoniyyot," p. 24), while Schorr, ignoring the evidence, denied the existence of Jacob ben Ephraim ("He-Ḥaluẓ," vi. 70). idem, in J. Q. R. x. 159.